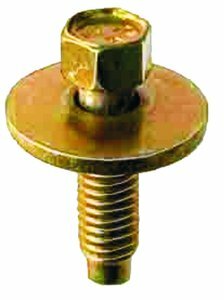 This is an M6-1.0mm x 18.5mm (3/4") bolt with a captive washer. It has a zinc and dichromate finish giving it a yellow color when new. It is the little brother to the N606676-S36, which is the same but 7/8" long. And, since I can't find a good source for this bolt I think I'd substitute the larger one.